djkardkreations: WOYWW 163 ~ SNOOPY; CASology #2 ~ HAPPY! WOYWW 163 ~ SNOOPY; CASology #2 ~ HAPPY! It's actually Wednesday morning and I'm linking to the amazing Julia over at What's On Your Workdesk? Wednesday on Wednesday. In twelve hours you can go from number 38 to number 138! It's that popular! For a great snooping adventure ~ check it OUT! It's a right blooming mess, complete with papers on the floor, and overflowing waste paper basket, because I am trying out a new system for storing my dies. There are more pictures and info below for those who want it. For those on the run (just why are the cops chasing you? ), see you next week! Have a great WOYWW tour! 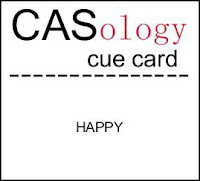 I'm also linking a card today with the fah-uhn new CASology challege, where the secret word is HAPPY! What could be happier than a chicken on a swing? Especially a chicken who looks like she's had a few! This card makes me as happy as, well, her! When I first got my Cuttlebug and some embossing folders and some dies a few short months ago, I made some room. Then I got more. Dang things are like rabbits! At first I thought this was an awesome idea: put magnetic tape inside empty CD holders and the Nestie dies nestle, as it were. But, truthfully, it didn't really work, not for me anyhoo. For one thing, they kept popping open. Maybe my tape was too think, but you really need to use deeper DVD holders, if you can find them. Then I saw someone had their dies snuggly in a CD disc soft-sided binder that holds a million of them. I went to Wally World and they had a smaller version of what I had in mind, but holding it in my hands let me visualize that this wasn't "me" either. I'm more of a look-over-my-shoulder-and-see-it-right-there lazy kind of a girl. A flip-through-my-fingertips kind of girl. You know, like money for crafts flips through my finger-tips. Ssssh. Then, I happened to buy a couple of used stamp sets and dies from Suzanne Dahlberg and she sent them to me in paper CD envelope sleeves. Hmmm. I liked that idea and so I am going to try it out for a while. I actually only had a few of the envelopes and (again) being too lazy to get in the car and go buy more, er, I mean, being cognificent of the environment, I just made some out of patterned 12 x 12 paper. Here they are in their new location. The binders hold embossing folders. This morning I moved them out of the ratty old blue box into a prettier box, because a photographer from "Ink My Stamp" is coming out to do a feature on the Playhouse. Shut My Mouth. I'm A Big Fat Liar. So that's it. If I like the system, I'll probably type labels and find identical envelopes so they all line up like little die soldiers to satisfy the OCD secretary in me. You might think I need therapy for that, but what you need to understand is that IS my therapy! I'm curious how many of you use a similar system and thanks Suzanne for sharing the idea with me!! I'm liking your system, it makes me as happy as a chicken on a swing! It's always great to see what works for others. I don't have any dies yet, so no system for me. I think I need to revamp my paper storage (because vamping didn't work). Love the new system! It looks very nice and organized :) The chicken on a swing is very fun - love her! Hi Darnell, no I am not a Princess, just very lucky old girl, I have trained my family well over the years - they all say, I wanted to buy you this or that but I know you would prefer craft goodies - and it worked! Love the chicken on the swing, such a happy card. I can't say that a chicken on a swing is the first thing that comes to my mind when I think "happy".... But if she's had a few, that's a different story! Oh happy day! I am loving that fun card. It would make me happy too. And how secret is the secret word if you just out and told us like that? Maybe you should be the one on the run from the cops??! Die storage! ugh! I started with the magnets inside CD cases too. Doesn't work. I live in an apartment complex and we all get phone books every few months left at both the front and back doors. We all pile them up for recycling. They often come with a magnet advertising some business or another so I swiped all the magnets. My dies were always coming unstuck and the cases opening so I was unhappy. Now I have this CD case, it is a little fancy cardboard box with a hinged lid. Inside it has little tiny hanging file folders that are like your CD sleeves. I put dies in them. If I want a die I just pull that whole "file." They are numbered so I can put them back nicely. I made an index that I taped inside the lid. I have them semi alphabetical. That is a bit too organized though because if I buy I Butterfly die now, well I have to move everyone down. Swinging chickens...what a hootin' happy card. That chick is swingin'! I'm so happy you're playing along with CASology again! As for dies, I have those expensive folders that are magnetized, but I think I like your idea better. What about dies (I'm thinking border dies) that don't fit into your envelopes? Or just make them all big? What I'd really like is a big magnet wall so I could put them all up and see them all instead of having to hunt for them! I am LOVING your LIM card and your filing system! Loved your post, Darnell! Your journey to the perfect filing system was to die for (sorreee...) - it appealed to the OCD in me too! What you've ended up with is a great system. I like being able to flip through things like that. I've got my embossing folders standing up in an open-topped box like that, with the embossing plates at the back, and it doesn't usually take me too long to find what I want, although they are not labelled. I keep telling myself that one day I shall decorate all the grotty boxes I use to store things in but there always seems to be something more important to do! Your card is just too happy, love that adorable little chicken! I have to say that when I saw your blog post title I was excited to see what you had to share about Snoopy-the dog and had to read through and find nothing, LOL. Always love seeing your desk, it always makes me feel a bit better about my mess. If I owned a swing, I'd be there with your cute chickie downing a couple to get "happy" :) Both are cute and fun cards! I'm slapping my forehead with the CD envelope idea - why didn't I think of that before? It's so easy and uncomplicated! Love that swingin' chick! How fun! I don't have very many dies and they're mostly Spellbinders. They are still in the cases they came in and I've put magnetic sheets in them to hold the dies. I can easily see the dies, all 4 sets! I do the same thing with the SU ones. I'll be interested to know your new system works in case I get lots more dies. Love your messy desk, not normally you is it? I store my dies in an A4 binder with half pocket pages and in the pockets I have magnet sheets that my dies stick too. I also have a little velcro strip at the top to stop the dies from coming out. It has taken me a few years to be happy with this system, this way I to can flip through like you do, I do it too. I hope your system works for you. Eliza #11 again can you believe it. Love that happy henny, Darnell! And that fun sentiment. My Cuttlebug lives in a gardening bag. Not quite as gruesome as it sounds. It's a funky pink and candy striped bag from Tesco with pockets around the outside. The Cuttlebug sits on the plates in the main section of the bag, and my Spellbinders sit in the outside pockets still in their original folders. Embossing folders and Tim Holtz dies sit in the other pockets. Small Sizzix dies live in a box in a cupboard. My dining room is my craft room so I need to be able to move things out easily, so this works for me. Hehe! It's a chicken on a swing! This so made me smile! Your posts always make me happy, Darnell, because I know I'll get at least one Lai out of them! :) that chicken is hilarious and really looks like she's good and happy! Lol to the chikkin! Love your storage system for the dies, that's something simple that even I could manage! Hope you have a wonderful weekend, thanks for popping by!! Totally get that for a system, I'm a flip through and select gal too. Mine are on sheets of magnet stuff stuck to sheets of chipboard and stored in a magazine file...flip flip select. Works so well for me. Makes me as happy as a chicken on a swing. Much like your posts do! Your chicken card is a hoot, but the CD envelope idea has me intrigued. I have mine in CD cases too. I am so used to having them there, the way they are, I am not sure I could stand it to CHANGE!!! OMGoodness! SO, So happy I am not the only one that makes a total mess of my space....or is it those pesky little gremlins that come in the night?? Sure wish I could get them to clean it all up. I hope your system works out the way you want it too! It looks like a great way to store a lot in a good compact way! !